It’s amazing what you can see during a lunchtime walk. I’m going to exercise my somewhat questionable bird-identifying skills again and proclaim this one to be a young Great Blue Heron. 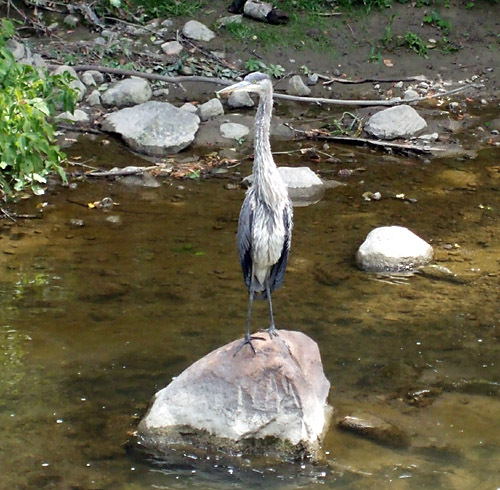 He stood on this rock in the middle of the East Don River in the Charles Sauriol Conservation Reserve for at least five minutes before starting his hunt for food nearby. More remarkable than this single bird though were the two deer that had been standing right beside him in the river. Naturally, both deer fled before I was able to get a clear picture. 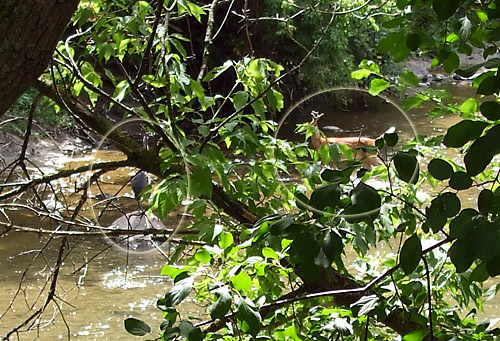 If you squint you can see one deer and the heron (both circled) in the shot below. ← Previous Previous post: Is the Taste of the Danforth in decline?